Burnsville Animal Clinic has been serving the south metro area since 1985 and has been in the same location since it was first opened. At that time the clinic was only 750 sq ft and had one doctor and one technician. Dr. Skilling purchased the clinic in December of 1992 and began remodeling the following day. He added new x-ray equipment, a full dental unit, an in-house laboratory and a second technician. He also converted all the old records into a computer-based veterinary software. After only two years he moved the clinic into a larger 2000 sq ft space two bays down from the original location and added a surgical laser, endoscopic equipment, a third technician and a groomer. Then in 2002 Dr. Skilling completed a third remodel adding a 3rd exam room with a lift table, additional office space, a lunchroom and expanded both the treatment and surgical areas. He has since added a digital microscope, a new Chemistry analyzer, a CBC machine, digital dental x-rays and upgraded the computer system. In 2015 the clinic was able to improve our radiology and upgraded to a digital unit allowing us to improve the quality of images. In 2018 our practice saw a lot of exciting growth. We were able to bring Dr. Jessica Cincoski. Dr. Cincoski is a graduate of the University of Minnesota and brings new and exciting treatments. 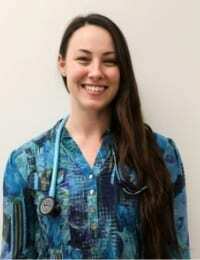 She has completed her course work for Veterinary Acupuncture and has a strong interest in Ultrasonography, and treating exotic pets including small mammals, birds and reptiles. We have even expanded our hours in to Saturday to better fit into our client’s schedules. We have also been able to add 3 veterinary assistants and a practice manager. Dr. Skilling graduated from the University of Minnesota College of Veterinary Medicine with a Bachelor of Veterinary Science degree in 1979 and a Doctor of Veterinary Medicine degree in 1981. He practiced in Wisconsin Rapids, WI for one year and then in Roseville, MN until returning to the University of Minnesota in 1985 to earn a Ph.D. in Veterinary Pharmacology with a minor in Neuroscience in 1989. He did research and taught pharmacology part-time to veterinary students until he returned to private practice, buying Burnsville Animal Clinic in 1992. He lives with his wife Sandy and has six grown children and ten grandchildren. He currently has two greyhounds (Hamish and Dunkin), a whippet (Porsche), two young rescue cats (Archie and Quilleran), four horses (Barrack, a Saddlebred rescue, Guiness, a National Showhorse, Roman, a Dutch Carthorse/Percheron cross and Molly, a Shire and he also has numerous fish. He is currently learning to drive Molly and to ride dressage on Guiness. He also fosters greyhounds for Greyhound Pets of America. Dr. Jessica Cincoski graduated from the University of Minnesota with her bachelor degree in Animal Science in 2008, and received her Doctor of Veterinary Medicine from the Minnesota College of Veterinary Medicine in 2012. She worked in small animal and emergency medicine for 6 years before joining the team at Burnsville Animal Clinic. 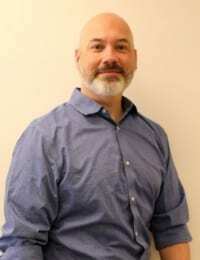 Dr. Cincoski enjoys caring for exotic companion animals in addition to dogs and cats. She has experience caring for a variety of species of reptiles, birds and small mammals such as guinea pigs and rabbits. She is also skilled in veterinary acupuncture and complementary medicine, completing her coursework at the Chi Institute in 2015. She is excited to be able to offer clients the best of Eastern and Western medicine options. Besides her love of all things animal related, Dr. Cincoski enjoys doing yoga and meditation, long bicycle rides on sunny days and camping up north. She shares her home with a dog named Pepper Potts, 2 cats, a rabbit, chinchilla, 2 ferrets, several crested geckos, and her boyfriend Joe. 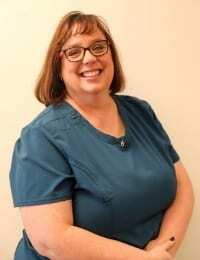 Brenda graduated from the Medical Institute of MN with an AAS in Veterinary Technology in 2002. She began working at BAC upon completion of her internship. 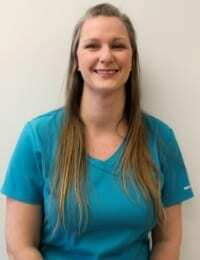 She enjoys working with clients to educate them about their pets and help individualize their needs, assisting in surgery and performing dentals. When not working, you will find Brenda at home with her husband, son and their cat, Milkdud. She loves spending time outside, knitting and reading. Kristen is a 2010 graduate of Michigan State University with a Bachelor of Science. After graduation, Kristen joined a mixed animal practice before relocating to Minnesota in 2013. Since then, she has been working in a small animal practice and began her journey with us in 2017. Kristen loves spending time with her husband and two long-haired Chihuahuas, Meeko & Bella. She enjoys reading, traveling, and making “book art” in her spare time. Shaelyn is a 2015 graduate from Argosy University with her AAS in Veterinary Technology. After finishing an internship at BluePearl Veterinary Partners, she worked in the Oncology/Internal Medicine for 2 years. 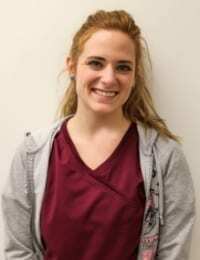 She joined Burnsville Animal Clinic in 2017. Shaelyn has two cockapoos named Lyla and Lacy. She also owns a canary named Rocky. She enjoys helping out with her husband’s business, spending time with her dogs, and traveling. 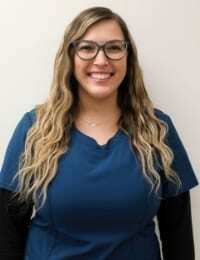 Roxann is our receptionist and vet tech assistant. In November of 2016, she moved her grooming business into our clinic. While working here she fell in love with the medical side of the clinic. In December of 2018, she reluctantly retired from grooming, a career she enjoyed for 8 years. Roxann is now pursuing her interest in becoming a technician. She specializes in all things poodles, she has two standard poodles at home Viva and Kachina, you will always find at least one of them at the clinic with her. During her off hours, you can find Roxann and her husband Owen playing games (she even beats Owen in Scrabble once in a while), walking their dogs, or just plain enjoying their empty nest. Owen and Roxann are the proud parents of Bryce, a Junior at Michigan Technology University (the snowiest school in the country), and Abby, a sophomore at Cornell College. Roxann enjoys volunteering her time, playing bunco, and participating in a book club. She often says she can grow kids and dogs but nothing green! Jerry is our practice manager and joined our team in September of 2018. He is a Licensed Veterinary technician, from Virginia with almost 30 years of experience in the veterinary industry. He moved to Minnesota from Virginia Beach VA where he grow up. His passion for pets is constantly evolving. 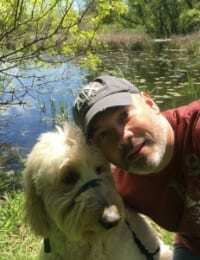 He has worked as a veterinary practice consultant for the American Animal Hospital Association (AAHA) for 10 years traveling the US, Canada and Puerto Rico accrediting veterinary practices of all kinds. Jerry also is the proud pet parent of two, 85 pound, doodles Luke golden doodle and Connor a labradoodle. When not at the clinic enjoys taking his doodles out for hikes, swimming and kayaking at all the beautiful lakes around the area. Sylvia is a former groomer with 5 years of experience and joined us in 2018 as a Veterinary Assistant. She is currently enrolled in Penn Foster’s Online program studying to be a CVT and expecting graduation in 2020. 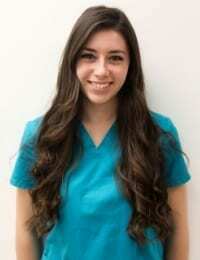 Here at work she enjoys assisting with dentals and radiographs. Growing up, Sylvia lived with Papillion mix – Mickey, kitty – Willow, cockatiel – Sammy and a number of beloved rodents. Currently, she lives in Bloomington with her husband, Danny and Rhodesian Ridgeback mix, Shiner. When not working, Sylvia loves to travel with the most memorable trip being in August 2018 to Norway, Spain, and Iceland for her honeymoon. Otherwise, at home, she loves to read, do yoga and snuggle with her boys binge-watching Netflix of course! Julia joined the clinic in 2018. She attended the University of Northwestern – St. Paul, where she received a B.S. in Biology. 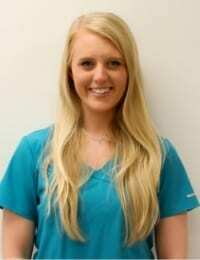 She has spent time interning at the Wildlife Rehabilitation Center of MN and working at Animal Humane Society. During her free time, she loves traveling, visiting national parks, hiking, and horseback riding.